We’re looking ahead to the May Bank Holiday weekend and our Helicopter Pleasure Flights taking place – weather permitting – from Holmfirth, Glossop and Sheffield. On Saturday 2nd May, you can pre-book to fly from either the famous Huntsman Inn – situated high above Saddleworth Moor just outside the famous village of Holmfirth – or at The Grouse at Glossop, in in the High Peak of Derbyshire. 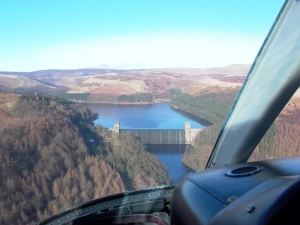 We offer a range of flight length options, from 5-minute flights taking in the immediate local areas around Holmfirth and Glossop respectively, to extended 30-minute ‘Dambusters Run’ flights from both locations, taking in some of the most spectacular countryside and historically significant landmarks England has to offer. During the Dambusters Run, you’ll retrace one of the thrilling Dambuster training routes flown by the famous 617 Squadron as its heroes mastered low-level flying, perfected their ‘dambusting’ technique and prepared for their daring strike on the Ruhr Valley. You’ll fly at around 1,500 feet, taking in some of the most picturesque scenery the Peak District has to offer. If you’re flying from The Huntsman Inn, Holmfirth, depending on the length of flight chosen, you’ll fly over Holme Valley, Compo’s Country Trail (prime Last of the Summer Wine country), Marsden Moor, across High Peak to Ladybower and Derwent Valley. If you take the 30-minue Dambusters Run, you’ll return via Bleaklow, famous for its WWII aircraft wrecks. If flying the Dambusters Run from Glossop, your helicopter pleasure flight will take you out via Kinder Scout and the spectacular Kinder Downfall waterfall to Ladybower, Derwent and Howden Reservoirs; and if you choose the 30-minute option, you’ll come back via the High Peak (Bleaklow) and its aircraft wrecks (including, most famously, ‘The Flying Fortress’). On Bank Holiday Monday, 4th May, we will be flying from The Moorlands at Owler Bar, Sheffield. You can take 5-minute flights over the local area to 10-minute flights over Hathersage and Stanage Edge. 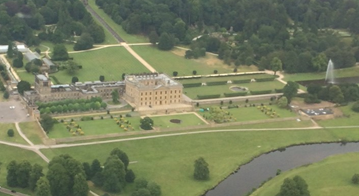 The 15-minue flight, meanwhile, is the glorious Chatsworth Tour, encompassing a flight over one of England’s very finest stately homes, and the beautiful countryside of Bakewell. Our Sheffield pleasure flights have their own versions of the Dambusters Run, with the 20-minute version taking you via Hathersage, Stanage Edge, Bamford and the Ladybower and Derwent Valleys, while the 30-minute option takes you to and around Dams, then across Hope Valley to Bakewell and Chatsworth. We’d love you to join us for a weekend of pleasure flights and experiences you will never forget!